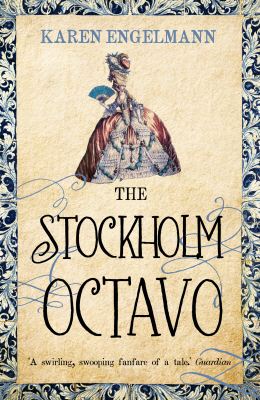 The Stockholm Octavo, by Karen Engelmann, is an historical novel set in Stockholm in the late 18th century. It follows Emil Larsson, a Sekretaire working in customs, who has been told by his employer that he needs to marry in order to retain and improve his job and his social position. The enigmatic Mrs Sparrow performs a mystical card reading called an Octavo for Larsson, giving him hints of eight people whom he must find in order to find the love and connection her vision has foreseen for him. Larsson’s story is set within a period of unrest and political intrigue which influences and is influenced by Larsson’s aims. I found the book interesting, compelling, and well-written. The narration is as of a person collecting information about the events after they have occurred, naming his sources, and giving his own account of those events he was present at. This is a powerful way of conveying the plot, and even hints at some later developments if you’re paying attention. There’s a strong theme of interconnectedness running through the story – how events influence different characters, who in turn react to those events and interact with one another according to their own personalities and agendas. This complexity is well-handled and never becomes overwhelming or unbelievable. The Octavo itself, the eight-card arrangement, brings in an element of mystery and a source of drive for Larsson. It provides a powerful hook, producing questions and a framework to the story that I, as a reader, felt the need to fill in and work out along with Larsson. Engelmann is careful not to confirm whether the magical elements surrounding the Octavo are in fact genuine within the world of the story or a product of human psychology and pattern-recognition, which to a certain extent leaves it up to the reader to decide whether this is in fact historical fiction or whether it has fantasy elements in it. Immediately after I finished reading the book, I felt that one plot line’s conclusion was somewhat anticlimactic. On further reflection, though, I feel it was concluded entirely appropriately. Engelmann is writing within an historical framework and cannot change well-recorded events wholesale. I don’t wish to spoil the ending; I will simply say that what I initially felt was understated was in fact entirely within the scale of the side-plot it was part of. Larsson’s story, the parts he acted within, had a fittingly exciting and complex climax. I very much enjoyed The Stockholm Octavo. It is well-structured and gripping, with interesting multi-faceted characters, a powerful hook and a depth of understanding of humanity. I rate it 10/10.